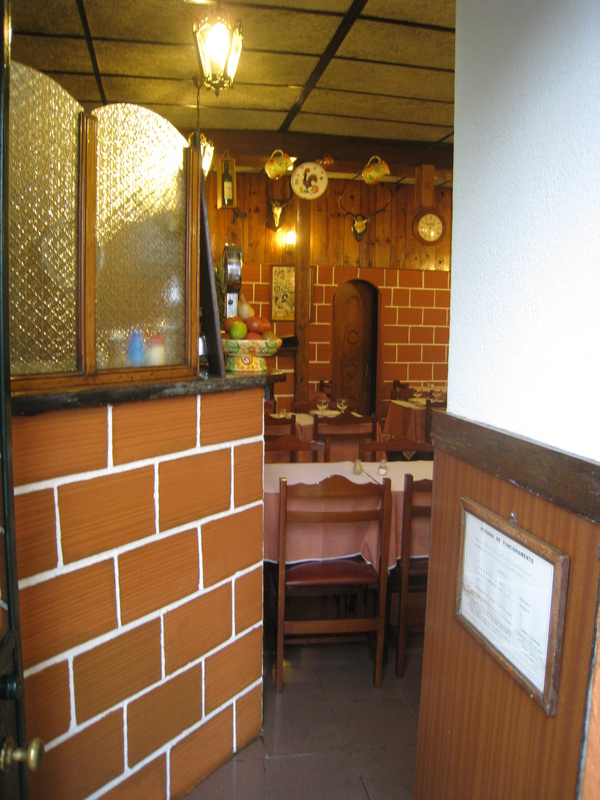 Best Meals, Fish, food, Portugal, Restaurants - let's eat chic, Transport - planes, trains and automobiles, Travel - bon voyage! Exploring Lisbon in the rain didn’t dampen our spirits, but unless we wanted to get well and truly squelchy, Monsieur and I were going to have to stop and dry off. So far that day, we’d smacked our lips after wonderfully oozy custard pastries with breakfast, had ventured onto one of the city’s bright yellow funiculars, explored the Castello, taking special care NOT to slip off the ramparts in the pouring rain and had splish-sploshed our way around the hill-top ‘burb of Alfama. Now we were both dripping and hungry, so why not kill two birds with one stone and find somewhere to dry ourselves whilst eating? On such a rainy day that would always be a winning combination for a couple of inveterate foodies like us. We walked down the hill from the uppermost reaches of Alfama, heading for the church of Antâo da Se, which we wanted to visit later because it sits on the site of the birthplace of St Anthony of Padua. Years ago I’d seen St Anthony’s mandible relic in Padua Cathedral – shrivelled, completely wizened, yet revered as it sits in its glass case with pilgrims filing past to pay homage. St Anthony was renowned as an orator, so it probably isn’t as innocuous as it sounds for the Catholic church to keep his jaw bone as a relic. What I hadn’t realised at the time is that although St Anthony died in Padua, he had been born in Lisbon, so in this part of the world, he’s quite appropriately known as St Anthony of Lisbon. Perfectly placed for this particular pair of dripping wanderers, a tasca (tavern) stood just paces from the church. It looked unprepossessing from the outside – with grubby blue-and-white tiles to the sides, a tired awning and dusty green grills at the entrance, but peeking timidly into its entrance we felt warmth. Our noses were then drawn further in by the aromas various wafting across the front counter. We, the drenched ones, were in luck. There was a table for us, but it would be a bit of a squeeze – the room was small, with only a handful of tables, and space was at a premium. It didn’t matter. 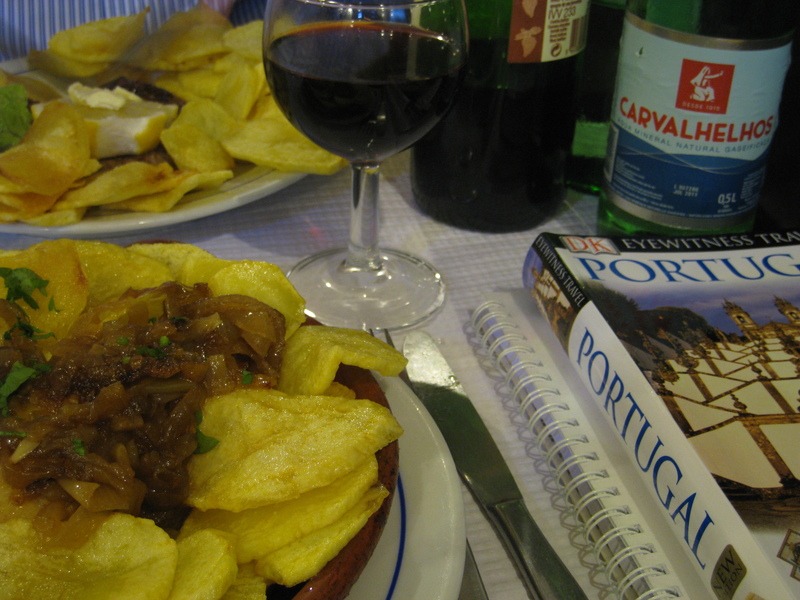 We shook off our brollies and picked up the menus – and my little Portuguese-English menu translator, which was invaluable because Portuguese is a tough, tough language for a foreigner to grapple with. Bread and cheese turned up automatically (that’s the way in Portugal, but if you eat it, they will charge you for it, so if you’re not in the mood, return it straight away ) and we sat back, working for our dinner, quite literally, as we translated the menu, line by line. Eventually, we were confident enough to order. Monsieur and I shared Gambas al Ajillo (garlic prawns) and Melâo con Presunto (melon with ham) to start. The prawns arrived spitting and sizzling in hell-hot oil, but the garlic had miraculously not browned or turned bitter; instead, it was soft and flavoursome. We could tell from the first mouthful that we’d still reek of the stuff in ten hours’ time, not that it mattered, not even if a few Lisboetas were to be asphyxiated by our outgoing breath later on. Having seared our palates with the heat of the prawns, the cool melon helped soothe hot mouths enough that we could still taste the food before us. This was lucky, because the ham was not to be missed! With the appearance of fine slithers of Burgundy leather, it was surprisingly easy to eat, not at all chewy as one might expect. It was a rich, dry and dark variety, with the taste of something aged and sophisticated, prompting me to wonder if it was one of the famed Portuguese hams, Alentejo, which is made from black Iberian acorn-fed pigs, although the modest price only indicated that perhaps the kitchen had given us their special stock in error? How was it possible that ham this flavoursome could be so inexpensive? For his main course, Monsieur tried the Bife do Lombo, a sirloin steak, with fries. On the menu, there were several different types of steak to choose from, depending on the cut, so it had taken us a while to work out the differences. We really would have been lost without my little menu translator. The fries were truly amazing – they’d been sliced into coins and deep fried with a teasing texture; even though they were less than half a centimetre thick, the exterior still managed to have a light crunch to it while the interior remained fluffy and soft. In the weeks leading up to this trip, I’d been dying to try a couple of salt cod dishes. I’d already had some salt cod croquettes at Bom Jardim, and they tasted fine but had a habit of sticking to the roof of my mouth. In other words, they were dry. Now was my chance to try salt cod in a different form. 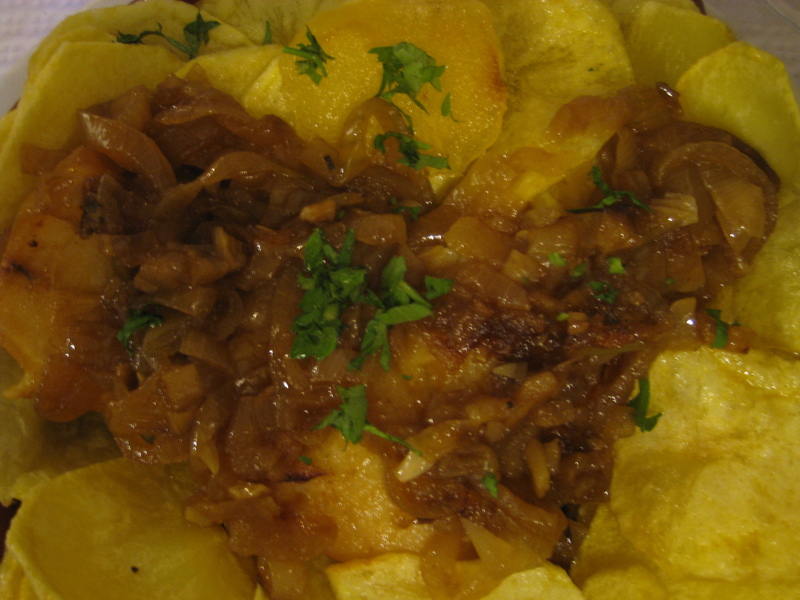 I ordered Bacalhao al Minho, which is salt cod fried with onions. It appeared in a shallow terracotta casserole, with the cod hiding in the bottom like a galleon’s precious cargo. (If you could taste it, you’d know I’m not exaggerating here!) It was aptly topped with the golden coins of fried potato, creating a sort of Portuguese fish pie. The onions, fried soft and caramelised, were strewn on top of the dish, with a sprinkling of parsley garnish to add the merest dash of diversion to eye and palate. I dove straight into the plate with relish, quietly congratulating myself for choosing such a comforting meal on such a miserable day. The salt cod was strong and salty, with a texture a bit like canned tuna. Apart from the odd stray fish bone, this simple meal warmed me from the inside out. A bottle of house red (Santo Isidro, Vinho de Mesa, Pegões-Velhos) was perfectly drinkable table wine and astoundingly good value at €4.90. A large bottle of the local mineral water, Carvalhelhos, helped dilute the damage so that when we visited church later, Monsieur and I wouldn’t frighten the priests or volunteers by gushing wine fumes into their faces. The incredibly reasonable bill arrived and we paid it in disbelief, leaving a decent tip to offset the feeling that we’d just taken advantage of the tavern’s proprietor. Tasca da Se had been a port in a storm – warm and welcoming, with delicious fare, and we’re not the only fans of this unprepossessing little eatery; other foodies who’ve discovered this tasca rave about the Porco Alentejana (pork with clams) or the Sopa Alentejana (soup with a lot of garlic, giant croutons, coriander/cilantro and a poached egg). Dear Monsieur, if you read this, please can we go back to Lisbon? 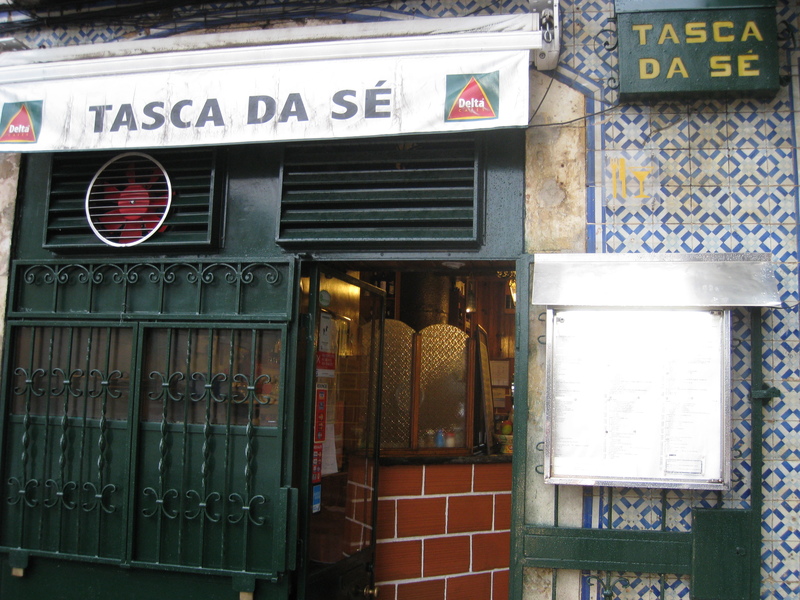 It’s time to return to Tasca da Se and have another go at their menu. Next Post McDonald’s, France: Venez comme vous etes! I hate you. … well not hate exactly, but I read these entries at night before I eat … and it’s messing with my mind. note: lots, good, and I’m stuffed are my only adjectives usually. hee hee! PR – perhaps you should read them at another time so you don’t get hungry when you should be sleeping? Either that, or have a little snackeroonie with my posts. It was pleasant reading your post. Photos look great too! I’d love to share, so I linked your post on my website. Hi CheapnYummy – thanks for your comment and the link. I’ll be checking out your latest recommendations soon.